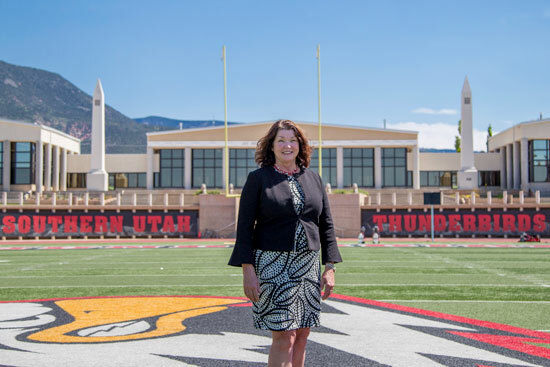 After serving for five months as the Southern Utah University Interim Athletic Director following the departure of Jason Butikofer, President Scott L Wyatt has named Debbie Corum the Athletic Director. "Debbie arrived here with 28 years of experience in collegiate athletics. She quickly proved her vision and leadership are exactly what we need at this crucial time," said President Scott L Wyatt. "SUU athletics will flourish under her compassionate and fearless direction." Corum is the first female Division I Athletic Director in the state of Utah. Only 35 of the 351 NCAA Division I schools have a non-interim female athletic director, Corum's elevation bumps that number to 36. "I have been blessed to learn from some of the best in the business of intercollegiate athletics: Mike Slive, Roy Kramer, and Ted Leland just to name a few. When Harvey Schiller hired me to work in the SEC in 1989, this opportunity wasn't even a dream. But the guidance from so many along the way has prepared me for this time to lead the SUU Thunderbirds into the next chapter." Corum said "Our priority will be to develop the mind, body, and spirit of all student-athletes with a commitment to provide a positive student-athlete experience while continuing to develop winning programs." Prior to serving as the interim athletic director, Corum served as the senior associate athletic director - senior woman administrator since May of 2016 where she provided leadership and direction with respect to student-athlete welfare, community relations, sport supervision, and as a member of the executive leadership team providing guidance and support to the entire athletic department. "Debbie's extensive experience in collegiate athletics, combined with her enthusiasm for the University and community, makes her the best person for the job," head cross country and track & field coach Eric Houle said. Corum brings a wealth of experience to the helm of the athletic department. Before joining the Thunderbird family, Corum was the senior associate athletic director - senior woman administrator at the University of Connecticut. "Debbie is passionate about our student athletes, our coaches, and Southern Utah University," head men's basketball coach Todd Simon said. "Her experience and relationships are tremendous assets to our programs. Thunderbird athletics will continue to emerge under her leadership." Before taking a position at UConn, Corum spent time at the Southeastern Conference (2000-2012) as the Associate Commissioner of Sports Administration. She also spent four years at Louisiana State University (1996-2000) as an Associate/Assistant Athletic Director for their Olympic Sports after spending two years at Stanford University (1994-1996) as an Assistant Athletic Director of Intercollegiate Sports. "I am grateful to President Wyatt for entrusting me with this opportunity and want to thank Board of Trustees Chair Eric Leavitt for always and forever supporting Southern Utah University," Corum said.